The HBO Bryant Park Summer Film Festival presented by Bank of America is one of New York's great outdoor events. Guests from all over set up camp on the lawn with an assortment of goodies and treats. If you're heading over right after work and need a quick bite to eat, Hester Street Fair will be setting up shop on the Fountain Terrace with a host of fantastic vendors (be on the lookout for a feature on them soon.) We've also got our park mainstays, Breads Bakery, Wafels & Dinges, Le Pain Quotidian, COFFEED, and Southwest Porch at your service. But if you're feeling a little adventurous and you're in the area early looking to throw together a picnic, we've complied a list of a few of our favorite local spots to grab all the supplies you'll need. Don't let the line discourage you, these pastries are worth it. 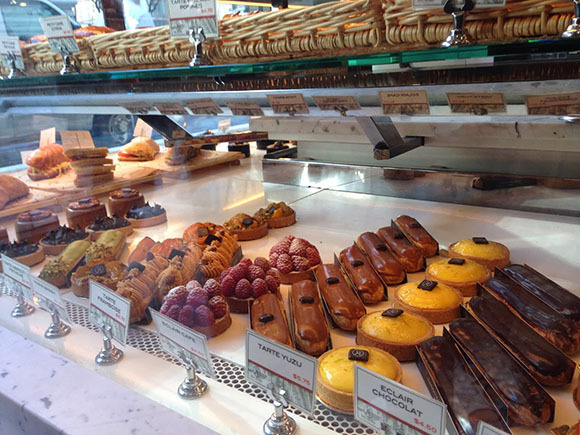 Maison Kayser - One of our favorite local bakeries, Maison Kayser is known for their endless variety of french baked goods which are made on-site all day long. They not only have delectable pastries and tartes but also baguettes and sourdough breads as well as sandwiches. If you're in need of beverages for film fest Maison Kayser has got you covered with their selection of fresh juices and coffee. Murray's Cheese - This West Village staple has a Midtown outpost that isn't to be missed. Perfect for any picnic basket cheese plate, Murray's offers an assortment of fine cheeses from all over the world. Whether you're looking for a fine Brie or a hearty Gouda, you'll find it here (they even have water buffalo cheese!) They also stock a healthy variety of sliced meats like salami and prosciutto and sell other picnic must-haves such as nuts, crackers, dried fruits, and pâtés. These baskets will bring your #BPFilmFest Instagrams to the next level. Zeytinz - Zeytinz might look unassuming from the outside, but it's definitely an essential stop for your picnic. During the lunch rush it's known for its counter service where you can grab all sorts of sandwiches and hot foods such as Tex-Mex and paninis. Zeytinz's is more than a one-trick pony though, hidden in the back is a small grocery section with a variety of fresh produce and organic snacks. The deli counter has a wide selection of meats you can get wrapped up if you want to pair with your Maison Kayser baguettes. Best of all however is hidden on the second floor. Wander up the unassuming staircase and you'll find an entire section devoted to baskets and other gifts. Rosen & Chadick Fabrics - So you've got your baked goods, sandwiches, beverages, snacks, and even a chic basket to pack everything in but how will you demarcate your section of the lawn? Thankfully, Bryant Park happens to be close neighbors with the Garment District. Need a Picnic Blanket DIY style? A short walk from the park on 39th Street brings you to Rosen & Chadick Fabrics hidden on the 2nd and 3rd floor or a mid-rise building. They have a well organized variety of fabrics from all over that you can have cut to size in no time by their attentive staff.